That's right another thread! I'm finally making another thread and leaving electrobrains' alone, as I now have a website for info and builds. The new site is at ds4windows.com. DS4Windows was a project originally started by InhexSTER by the name of DS4 Tool. The tool was later branched off by electrobrains. I then later made my own branch of it. This program allows the PS4 controller (DualShock 4) to emulate an Xbox 360 controller, which allows far more games to be compatible with the DualShock 4 than out of the box. Wait so there's other versions before it? So what's so special about yours? Well I really just wanted to make my own version with my own UI and features. The first two of the programmers hadn't had things I wanted such a tool to have such as profiles. So where can I download? The first build as of moving to new servers is below, however you can always get the newest build via ds4windows.com. It's a portable program, meaning you can place the program where ever you want: in your downloads folder or program files, it's up to you. If it's your first time using the tool, you will need to install a x360 emulated driver for this to properly function, DS4Windows will properly walk you through this. Check Hide DS4, some games can actually read the DS4's input without this program. Make sure to connect your controller while the game isn't open as hiding the ds4 only works when such games or clients like steam or uplay aren't running/taking control of the controller. 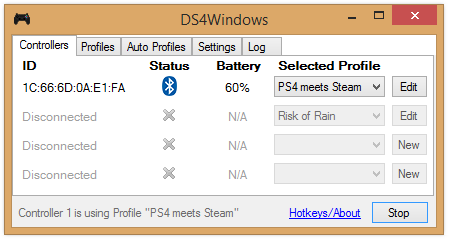 You will see a warning in the log/bottom of DS4Windows if the controller could not be exclusively gained. Since the idea is to get to get your controller ready for games, The UI was made to make to be quick to pick up. Once first launched, the tool takes your through the setup, gives you a default profile and you're ready to go, or if you choose you can change things to your heart's content. With profiles, it makes it easier to quickly swap through various settings for your controller. You can set up controls for certain games, or set the lightbar to your favorite color. You can even swipe two fingers along the touchpad to swap profiles without the need to even open back the program. From control mapping, to touchpad sensitivity, to marcos, to rainbow lightbar, to motion controls, to launching a program with profiles, there are plenty of settings to play around with. If you have any more questions feel free to ask in this thread. UI fixes, with clearer errors and "Open DS4" changed to say "Open DS4W"
If you choose to open DS4W after an update, DS4Windows will update the updater, so you won't see the command prompt window if you choose this route. Edit: In the new version when minimizing, there is a window hidden behind the start button at the lower left corner of the screen. It's titlebar is visible. And just for reminder, the mouse acceleration checkbox needs for the checkmark to be able to be saved (don't know if that was still in mind for the future). (10-14-2014, 12:43 AM)shinra358 Wrote: Congrats! That's weird I don't see a window I guess for now I revert that, and ds4windows will just have to stay in alt+tab. I'm currently building on Windows 10, and DS4Windows didn't show in the alt+tab menu, even in the previous versions. What I'm getting at is I won't be able to test if it's removed from the alt tab menu myself. EDIT: As a reminder though, mouse accel setting does save, it's only when reopening settings, it's unchecked. The window is not there when it first turns on. Pressing the minimize button makes it appear. Oh yeah I know it saves, I was just talking about It being unchecked when reopening like you said. (10-14-2014, 02:24 AM)shinra358 Wrote: The window is not there when it first turns on. Pressing the minimize button makes it appear. Just tried it on windows 7 and it seems you are correct. There is a small window that stays minimized in the bottom left. I'm running windows 8.1 and it works fine. Also J2k have you looked into the left/right motor mappings? There was some discussion on the forums, electrobrains switched the motors in one of his earlier builds but the motor mappings were correct before this swap. An easy way to test it is by testing big/small motor in pcsx2 lilypad settings. Ooh, congrats on launching the website! I'll definitely be sticking with your branch. I'm very impressed with this, I will begin using it immediately! Thanks for putting your time and passion into a beneficial project for everyone! Nice job on the website. I, too, am here to report the mini window in the bottom left. On Windows 7. Current time: 04-26-2019, 10:30 AM Powered By MyBB, © 2002-2019 MyBB Group.